The current version of the Dive Alert from Ideations improves upon the original instantly recognizable product for divers. The original version is a small, light weight air horn that emits a tremendously piercing sound that can be heard above the water as far away as 1.6km. 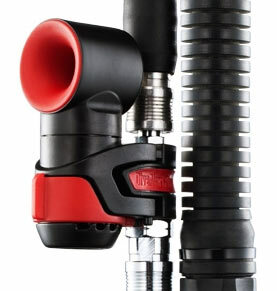 Attaching between the power inflator or inflatable octo on the bcd and the low pressure inflator hose, the unit uses a small amount of air from the diver's cylinder to allow a diver on the surface in all visibility conditions to signal his partner or a boat. The Dive Alert Plus v.2 is more than a simply redesigned version of the old original. While the Dive Alert Plus v.2 offers a new, redesigned, and more streamline look, the difference goes much deeper. The newly updated design on the case not only makes the unit more appealing but it's also more ergonomically efficient to grasp and operate. The older unit requires the user to push the button straight inward around the 'guards' situated around the button that are designed to prevent accidental operation of the horn. This design can prove problematic when used with thicker gloves in cold water conditions. The streamlined design of the Dive Alert Plus v.2 lets the user grasp the unit and wrap their hands/fingers around the horn for a secure grip while depressing the button to activate the signaling device. While the Dive Alert has always been one of the most successful surface signaling devices available to divers the most significant improvement comes underneath the surface of the water. By depressing the button softly underwater the Dive Alert Plus v.2 creates a loud buzzing noise caused by a small piston vibrating against a stainless steel diaphragm similar in thought to a drum. This buzzing noise can help locate a lost buddy or get the attention of other divers in the area when needed. With its design placing it between the low pressure inflator hose and the bcd's inflator or inflatable octo, the Dive Alert Plus v.2 sits inline along the corrugated hose on the bcd and out of the way of snagging or the normal operation of the divers equipment. It comes in 3 different models to allow it to incorporate into any model of inflator connection.